The year 2001 was a fantastic one for me. After graduating from college, I spent the rest of the year traveling and literally dancing through my life - one month in Sevilla, Spain taking Flamenco lessons, a trip to the Greek isle of Patmos studying and developing a new performance on the path of Ancient philosophers, one month on a road trip through Southern France visiting medieval cathedrals and festivals to learn renaissance dances. I returned to Berlin in Germany to prepare for yet another great trip to perform as a dancer in South Africa. But hey, the year wasn't over yet, and one day during training, I landed a failed somersault so unfortunate that three of my vertebrae got fractured by the high impact of the fall. Plus, not just my bones got fractured, but also the spinal discs in between got damaged and their fluid leaked out. 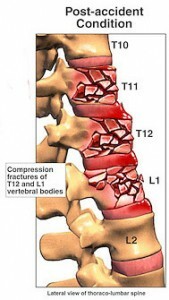 The spinal exhibit to the left shows compression fractures of the T11, T12 and L1 vertebrae as experienced by me. Usual treatment of injuries like these would be open surgical incision and spinal fusion with placement of titanium screws into T10 and L2, fixation rods to bridge the fractured bones, and maybe additional bone graft material to stabilize the back. It might sound like an advanced treatment. However, the surgery itself bears the risk to injure the spinal cord. The titanium stabilizer allows patients to get out of the bed and the hospital pretty soon - after only two weeks or so - but at the same time the spine will become stiff - just like the metal rods that bridge the bones. With no chance to move and be squeezed and released the spinal discs can't receive important nutrients and thus, can't regenerate. At even though patients are able to walk and be released from the hospital soon, they aren't fully mobile. In several conversations with doctors I learned that one frequently occurring issue is that when patients try to exercise or engage in physical labor such as lifting things or bowing forward, that the titanium screws break out of the bones. It's not the screw that breaks, but the bone, because the spine tries to bend and can't. Therefore for me as a dancer surgery was the worst option ever. I stubbornly insisted to allow the bones to heal conservatively. Each tissue in our bodies regenerates at its own pace. While a bruise heals after one week, and the taste nerves of our tongues renew every two days, broken bones require four weeks to heal. I had to lay in bed for four weeks straight - no getting up allowed at all! Then I spent another six weeks in rehab, learning how to move and walk again. Under supervision of a physical therapist I exercised to build strong core muscles and started some weight training. I swam on a slow pace half a mile every day in the sanatorium's pool, because the support of the water was more comfortable than standing upright. My entire focus was set on healing. And boy, was I happy and proud, but I was also stiff, and scared of falling again. I thought that that was it. Certain movements I would never be able to do again. Well, things changed dramatically when I came back to a more regular yoga practice again. In baby steps, I started rebuilding inner core muscles and pelvic muscles to support my body's weight and a good posture. Through practicing gentle back bends I strengthened my back muscles, and started to mobilize my spine through twists. Forward and backward bending, twisting, and stretching helped to transport nutrients into my discs, squeezing and releasing them like little sponges. While western medicine teaches that damaged spinal discs can't regenerate, I report that mine recovered fully! Lastly, I rebuilt my confidence and overcame the fear of getting broken again through practicing head-stands.